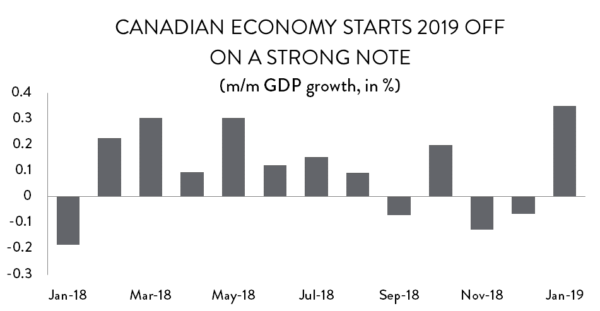 Despite continued weakness in the energy sector, the Canadian economy burst out of the gate in 2019 with its strongest month-over-month performance in more than two years. Growth was driven by large spikes in construction and manufacturing activity. After declining in three of the previous four months, the national economy snapped back in January, growing by 0.35 per cent – equivalent to a robust annualized increase of about 4.3 per cent. However, that growth came off a slightly weaker base than first realized; GDP growth estimates for December were revised downward from -0.7 per cent to -0.8 per cent. On a year-over-year basis, GDP levels are 1.6 per cent higher than they were in January 2018. 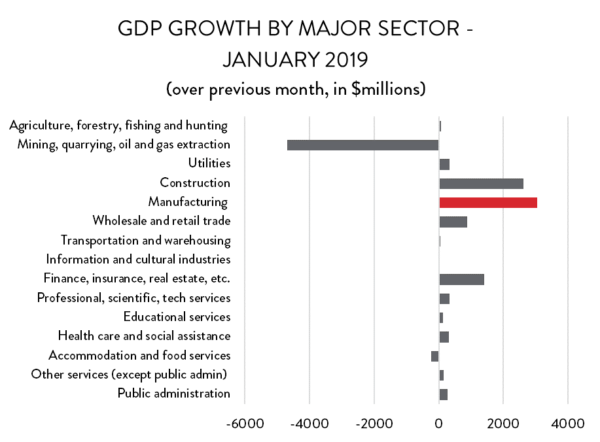 The surge in economic activity in January was felt almost across the board, but concentrated in goods-producing industries – the same industries that drove GDP lower in December. 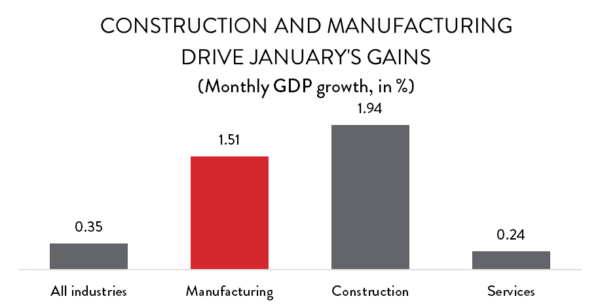 The construction and manufacturing sectors led the way, each delivering surprising and strong growth to start the year. After declining by a (revised) 9.7 per cent in December, construction activity rebounded with an annualized 25.9 per cent increase ($2.6 billion). Prior to the release of January’s numbers, GDP in the construction sector had fallen for seven months in a row. 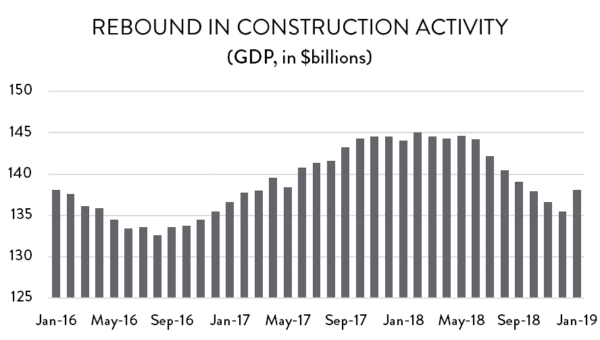 The spike to start 2019 helped erase the decline in three of those seven months, bringing construction GDP back above October levels. Meanwhile, the manufacturing sector saw value-added output jump by an annualized 19.7 per cent ($3.0 billion). That increase drove monthly GDP in manufacturing to its highest level in more than 16 years. Elsewhere, despite clear evidence of a slowdown in housing markets, January was also a good month for industries in real estate, rentals and leasing, where GDP rose by an annualized 4.5 per cent. There were also notable gains in finance and insurance, as well as professional, scientific and technical services industries. On the negative side, January was a predictably weak month for the energy sector. 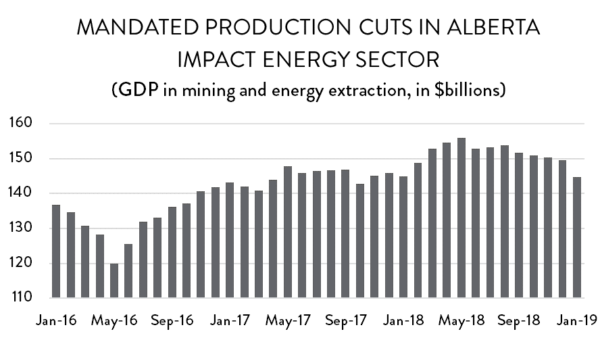 With mandated production cuts kicking in in Alberta, GDP in mining and energy extraction fell by 3.1 per cent – equivalent to an annualized decline of 31.8 per cent. That drop resulted in a loss of nearly $4.7 billion in value-added activity to the Canadian economy. The only other major economic sub-sector to see GDP decline in January was accommodation and food services. 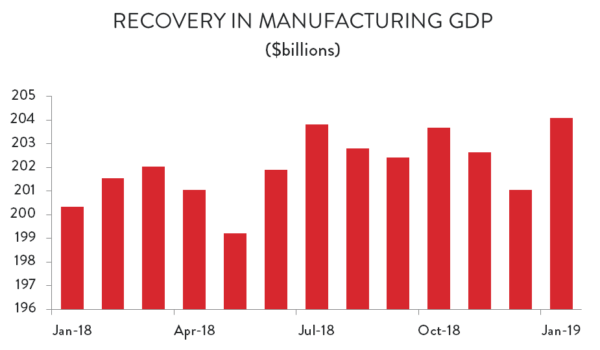 The 19.7 per cent annualized spike in manufacturing GDP represents the strongest month-over-month growth rate the sector has seen since November 2017. It was easily enough to offset declines in November and December and, as noted above, drove manufacturing value-added output to its highest level since June 2007. On a year-over-year basis, January’s spike means that GDP in the manufacturing sector is sitting about 1.9 per cent higher than it was at the beginning of 2018. Although overall growth in manufacturing GDP was unusually strong, results within the sector were surprisingly mixed. Of the 11 major manufacturing sub-sectors, only seven were higher, while there were notable declines in the remaining four. Strong growth in many of Canada’s smaller manufacturing industries also helped to drive overall gains. On a dollar-value basis, the largest increase in GDP came in food processing, where value-added output rose by $768 million – equivalent to an annualized increase of more than 39 per cent. At $28.3 billion in January, real GDP in food processing is at its highest level on record – with comparable data going back to January 1997. 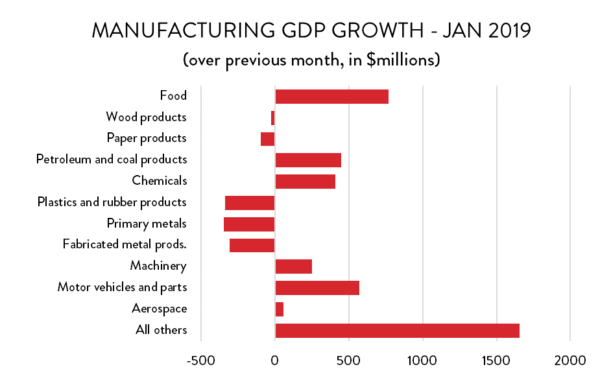 However, much of January’s strength in manufacturing GDP came in smaller, less-often-discussed industries. Specifically, GDP in furniture and related manufacturing spiked up by 6.1 per cent (103 per cent growth on an annualized basis). Computers and electronics manufacturers saw a strong rebound after a poor December, and producers of electrical equipment, appliances and related components had their best month since August 2002. On the negative side, weakness in steel manufacturing drove GDP in primary metals down. Fabricated metals GDP was lower on falling output in architectural and structural metals; and plastics production was down significantly as well.